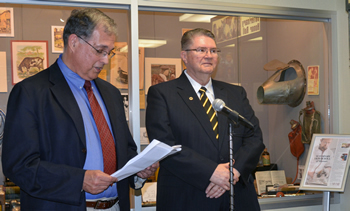 William Shore, DVM, chairman of the MVMA Foundation, reads the nomination of MU CVM Professor Emeritus William Fales to the Missouri Veterinary Medical Foundation (MVMF) Veterinary Honor Roll Sept. 10. MU College of Veterinary Medicine Professor Emeritus William H. Fales, PhD, was inducted into the Missouri Veterinary Medical Foundation (MVMF) Veterinary Honor Roll on Sept. 10. The Veterinary Honor Roll was developed to recognize veterinarians who have been nominated for inclusion by people whose lives they have touched. Fales is the only individual who is not a doctor of veterinary medicine ever to be inducted. MVMF Board members nominated him for inclusion. His name and photograph will be added to a display within the foundation’s museum at Missouri Veterinary Medical Association offices in Jefferson City. Fales is also the only non-DVM to be an active voting member of the MVMA. He was elected to full membership in the MVMA in 1991 and was elected to honorary membership in the Missouri Academy of Veterinary Practice in 1999. Susan Fales looks at her husband’s plaque after a ceremony inducting William Fales into the Veterinary Honor Roll. A native of Redding, California, Fales served in the U.S. Army Medical Service Corps from 1966-69. He then pursued a master of science and a doctorate in bacteriology at the University of Idaho, Moscow. He began his career at the University of Missouri in 1974 as a research associate in the Department of Veterinary Microbiology. From 1975 to 1981 he was an assistant professor in the Department of Microbiology and served as a clinical microbiologist for the Veterinary Medical Diagnostic Laboratory and the Veterinary Medical Teaching Hospital. In 1981 he became a tenured associate professor, and in 1986 was named a full professor of veterinary pathobiology. He was elected as an honorary diplomate of the American College of Veterinary Microbiologists in 1992. In August of 2015 he retired from MU, but accepted an adjunct appointment and was named professor emeritus. Fales was one of three people inducted into the Veterinary Honor Roll during the September ceremony. Joining him were MU CVM alumni Melanie Grundy, DVM ’98, of Carthage, and Charles Monsees, DVM ’54, inducted posthumously. 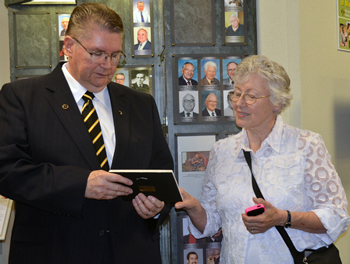 His widow, Joan, accepted the honor on behalf of her late husband.